The former Kattikiro of Buganda greeting General Amin who helped Dr Obote to destroy the King of Buganda's power base in 1966. 1986 – 1989: Served as Minister of Education. He oversaw the creation of Kyambogo University. 1989 – 1992: Minister of Planning and economic development. He oversaw the establishment of Uganda Investment Authority. 2002 – 2012: Served as Chairperson Uganda Land Commission. He participated in drafting the 1995 constitution. He was also a former MP for Masaka East and founder member of both Kabaka Yekka Youth Wing and Conservative Party (CP). Former Justice minister and Buganda Katikkiro (prime minister) Joash Mayanja Nkangi has died, his daughter Josephine Mayanja-Nkangi confirmed to Daily Monitor. He is said to have succumbed to acute heart failure on Monday at about 8:00am at Nakasero Hospital where he had been admitted after his health deteriorated. Nkangi has been, for some time, undergoing treatment for pneumonia pending transfer to India for further management, according to a family spokesperson. “On February 19, we realised that he was in a lot of inexplicable pain, so we rushed him to the hospital. Until this week, we didn’t really know what the extent of the damage was. The doctors said it was pneumonia. However, on Sunday, my father took a turn for the worse. An oncologist was called in and on Monday, we learnt that dad is seriously ill,” Ms Josephine Mayanja-Nkangi, said in a statement on Sunday. Mr Nkangi retired in 2014 following an illustrious public service career lasting more than 50 years. At the age of 80, he was still at the helm of Uganda Land Commission. He had previously served as Finance minister, Attorney General and Justice and Constitutional Affairs minister. He was Buganda Katikkiro at the time of the 1966 crisis. Nkangi's son, Marcus Luswanta told this reporter that his father’s body will be taken to his home in minister’s village in Ntinda, a Kampala suburb. Kitalo nyo okufiirwa Omugalagala ono. Naye no, Ono ye Kattikiro eyawunzika ekibya kyo buyinza bwa Buganda nabukwasa Central Governmenti nadduka n'ekitiibwa kya ddamula nagikuuma emyaka 27. Oluvanyuma nga Buganda yelwanye ko okukomyawo Obwakabaka kwekuzza ddamula eri Kabaka Mutebi II. Akoze emirimu gye mingi mukuwereza mu Republican African governments ezikula nga obutiko wano mu Buganda nga za Uganda. Zewadde obuyinza buno okufuga Obwakabaka bwa Buganda obumbula nga bwezagala kakati emyaka 51 okuva Abagenyi Abazunga Abalaaya lwebakyaluka 1962. 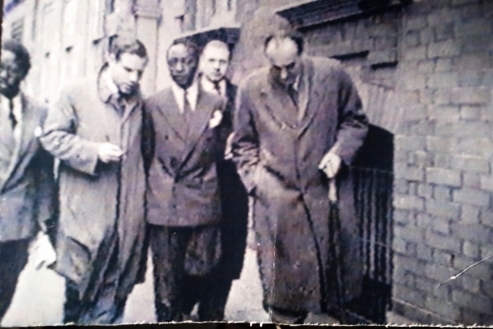 Bazunga wakati mu London 1953/55. EYALIKO omuwandiisi w’ekyama owa Ssekabaka Muteesa II, Ernest Ssempeebwa Ssebalijja afudde ekkiro ekikeseza olunaku lwa leero mu ddwaaliro ly’e Mmengo. Ssempeebwa yazaalibwa December 26,1918 era waafiiridde abadde aweza emyaka 95. Yasomera Buddo, Exeter University e Bungereza era n'akola obuwereeza obuwerako e Mmengo. Y’omu ku bakyusa Baibuli okudda mu Luganda. Mu 1993 Kabaka yasiima n'amuwa ekitiibwa ky’effumu n’engabo ekisingayo mu Bwakabaka ng’asiima emirimu emirungi gye yakolera Obuganda. Abooluganda lw'omugenzi baategeezezza nti oluvanyuma lw’abasawo okwekebejja omulambo waakutgwalibwa mu maka ge agasangibwa e Buwambo mu ggombolola y’e Gombe - Kyadondo. Cathedral for the royal family and invited guests. By Barbara Kimenye in her book on her work In Muteesa II's Mengo Palace 1955/60. The Kabaka was having none of it. He remembered all too well the meal The People had made over the infamous divorce case, and how their reporters had dogged him during his years of exile in the hope of discovering juicy transgressions with which to titillate their readers. Prince Kimera was not banned from the palace, but he was definitely on his own in dealing with his marital problem. A good thing, too, because at the same time as David, The People reporter, was sending his editor a torrid story of a weeping ‘princess’ scorned by her unfeeling prince and ostracised by the Kabaka and the Mengo set, Carol and Kimera were enjoying an intimate evening in the house of Kimera’s mother at the Kasubi royal tombs. This convivial evening was not without incident. As Carol later revealed to me and a few others who intrigued in the secret meetings arranged for the star-crossed lovers, all went well until Kimera excused himself from the bed to get a drink of water. He was away for rather longer than it normally takes to run a tap so Carol picked up the oil lamp and went looking, for him. She passed through the silent house and eventually came to a room emitting sounds of occupation. She opened the door and gasped. Her husband was in bed with another woman. It was a situation tailor-made for a journalist employed by the gutter press, but although David was told the story, he succumbed to Carol’s pleas that he should not use it. I think that another reason for keeping it out of his reports was the increasing impression that this peculiar marriage might, after all, have been made in heaven. To tell the truth, it soon transpired that David, for his entire initially brash, tough reporter act, was a very sensitive man. John Ayres and I got to know him well, became very fond of him, in fact. Since Carol was always sneaking off to be with her husband, and obviously did not care a hoot whether or not she was invited to the palace, David spent more and more time with us. Looking after Carol and trying to engineer dramatic events which would help increase the circulation of his newspaper, had not, it transpired, been an enviable task. He was thwarted at every turn. For a start, Carol was a competent artist and knew a lot about horses, but she could neither read nor write. This defect in no way reflected on her background or upbringing, which was middle-class by all accounts. Rather was it word-blindness: dyslexia was not wholeheartedly tackled as a problem in the late 50s and early 60s. David’s suggestion was that the money being paid to her by The People for the story of her marriage to an African prince be used for buying and training ponies for riding schools. Meanwhile, before coming to Uganda, he had coached her for hours in writing her name, Carol Kimera. Then there was the matter of her clothes. David had been given the job of taking her shopping for clothes suitable to her image as a princess. 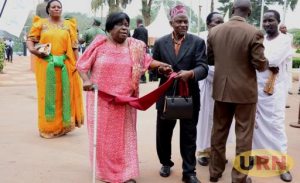 (The People management were not expected to know that wives of princes in Buganda were never entitled to call themselves princesses: they were Mrs, just like other commoners). Consequently, he fitted Carol out in the type of stylish yet modest outfits worn by the British royal family. His first moment of unease was felt when he noticed that she had turned up the hem of the smart travelling suit by about four inches. Worse was to come at the Lake Victoria Hotel in Entebbe where they were booked to stay. At breakfast one morning, David was suddenly distracted from his keen interest in the sausages, bacon, kidneys and eggs on his plate by the uncanny silence which had engulfed the dining room. He looked up to see all eyes on Carol who was advancing upon him with the hip-swaying nonchalance of a model on the catwalk. There was every reason for the stares: she wore the expensive dark blue cocktail dress purchased in Bond Street – only minus the billowing chiffon sleeves and satin underskirt. The folds of the chiffon skirt alone were insufficient to hide the frilly suspender belt and absence of knickers. David’s anguish increased when he later discovered her on the hotel lawn, pretending to read a magazine, with her skirt and knees drawn up in such a manner that anybody passing couldn’t avoid a tantalising view of what is normally hidden. Little wonder that his series of reports fizzled out like damp squibs. When, after two weeks, he and Carol returned to London, a crowd of us, including Prince Kimera and my mother, gave them a rousing send off. We never heard of either of them again. Throughout this mini soap opera, the Kabaka was kept informed of every move in the game, and avidly awaited each instalment. Although he refused to see Carol, his curiosity about her was boundless, and he was not shy when it came to questioning anybody who had been in contact with her. Like the rest of us who had to know her and David, I believe he found life very dull after they returned to London. Christmas at the palace followed a set routine. On the afternoon of Christmas Eve there was a children’s party in the Old Twekobe, a carol service given by the choir of Namirembe Cathedral for the royal family and invited guests, then, everybody dispersed to celebrate the feast in their own homes. 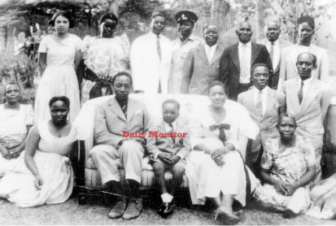 Although the party was mainly for the royal children, the Kabaka’s nephews and nieces as well as his own numerous sons and daughters who usually lived outside the palace with their mothers’ families, various friends were invited to bring their children along. These parties were very noisy and boisterous events. Sarah organised games, most of which seemed to involve everybody tearing round the room, shrieking their heads off. The Kabaka stayed out of sight until it was time to give out the presents stacked beneath a large tree. Who could blame him? What with the excitement of racing all over the place, eating masses of rich confectionery and drinking sweet sticky drinks, half the smaller children were bawling and ready to throw-up while the party was in full swing. All of them sat on the floor, facing the Christmas tree, for the distribution of presents. The ADC or one of the private secretaries read out the names, and each child came forward, or in the case of the very young, was carried to the Kabaka who handed over brightly wrapped parcels, presumably containing toys. Afterwards, the children gave His Highness three cheers which he acknowledged with a smile, then he thankfully withdrew. Only once, to my knowledge, was the procedure altered. Somebody with more imagination than sense thought it would be a good idea to introduce an African Father Christmas to distribute the presents. Nobody mentioned the change to the children. It was to be a wonderful surprise. Shock would be a better word for describing what happened after the curtains were drawn, the room lit solely by the multi-coloured bulbs on the tree, and the Kabaka broke tradition by sitting on the floor with the children. The expectant hush broke into pandemonium when from behind the tree emerged a grotesque figure wearing a mixture of animal skins an ancient raincoat, and a fiery red mask which appeared to have been painted with lumpy cocoa, plastered with cotton wool. A howl of terror went up, and there was a stampede for the door. The Kabaka was not exactly caught up in the rush to escape, since he sat in the front row, but his nearest neighbours knocked him sideways in their bid to get away. Nor was the panic confined to the youngsters. Several mothers sitting with me at the back of the room shuddered and hid their faces. But the show must go on. By dint of bribery, cajolery and threats, the children were coaxed back inside to accept their presents from the hands of the alarming apparition; but only after watching the Kabaka receive a present from it and shake it warmly by the hand. In many homes that Christmas, parents, including me, were coping with, or trying to, the aftermath of the disastrous party. I wasn’t alone in having to leave lights burning in bedrooms. And seemingly there was an epidemic of nightmares among the little ones who still believed that Father Christmas crept into the house to deposit presents: they thought that the thing from the palace was sure to turn up. To everybody’s relief, the experiment with an African Father Christmas was not repeated. The carol service, thank goodness, never varied in style or content. We all assembled on the lawn and spent an hour listening to the glorious mingling of voices provided by the Namirembe Cathedral choir. Music was and still is taken very seriously in Buganda. Both Namirembe, Anglican, and Rubaga, Roman Catholic, cathedrals have always had coral music of incredibly high standard, and they surpass themselves at Christmas and Easter. At the end of the service, as soon as the choir members were thanked and had exchanged Christmas greetings with the Kabaka, before being given light refreshments, the guests also wished each other and His Highness a Happy Christmas and they quietly went home. The princess, princesses and Ssaza chiefs generally went to their country estates, and the Kabaka’s immediate family to Bamunanika, his private palace.